The Lockheed P-80 Shooting Star was the first jet fighter used operationally by the United States Army Air Forces (USAAF). Designed and built by Lockheed in 1943 and delivered in just 143 days from the start of the design process, production models were flying but not ready for service by the end of World War II. Designed with straight wings, the type saw extensive combat in Korea with the United States Air Force (USAF) as the F-80. America's first successful turbojet-powered combat aircraft, it helped usher in the "jet age" in the USAF, but was outclassed with the appearance of the swept-wing transonic MiG-15 and quickly replaced in the air superiority role by the transonic North American F-86 Sabre. The F-94 Starfire, an all-weather interceptor on the same airframe, also saw Korean war service. 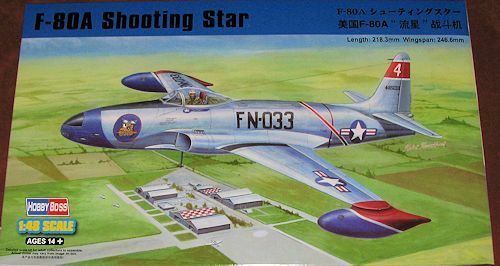 The closely related T-33 Shooting Star trainer would remain in service with the U.S. Air Force and Navy until the 1970s and many still serve in a military role or are in private hands. This kit has been much anticipated by fans of the Shooting Star. To date, we have only had the Monogram kit available to us and that one is from the 1970s. This is a new tool, engraved panel line kit with the now de riguer recessed rivet detail that is as modern as they get. The grey sprues are superbly molded with more than enough detail to satisfy most. There is a nicely done interior complete with seat, control stick and rudder pedals that fits into a tub with raised detail on the sidewalls. The instrument panel has a decal to help out. There are also interior sidewalls. A nicely done gunsight is included and there is an etched harness. Now, here is a bit of a quandary. The F-80A originally did not have an ejection seat. The kit only supplies a bang seat. A photo from the USAFM web site shows a late production F-80A with a bang seat, though the head rest is rounded. It is obviously flown by a test pilot as he is wearing a fedora. As it still wears the PN buzz number prefix, it would be from about the time of the kit markings which are from 1948 when the aircraft went from P-80 to F-80. 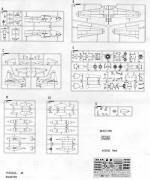 The kit has a separate forward and aft fuselage, breaking at the normal spot for working on or replacing the engine. In fact, you get an engine center section and the long tailpipe to install behind the main gear. This means you'll need quite a bit of weight in the nose to overcome this weight. Frankly, I don't see why this was done. One could have easily molded each fuselage half in one piece to save the seam, but things look like this was done to do a T-33 and F-94 using most of the same bits. I was glad to see that Hobby Boss got the proper canopy shape without the rear 'pip' of the F-80C, though it still seems a bit long to my eye. The cover for the gun r adar is a separate clear piece, though I'm not sure why. I should mention that the F-80A originally had no gun radar and had a landing light installed in the nose. The radar was later retrofit into extant A models. While on the subject of the fuselage, I have to say that to my eye, the intakes look too large. The lower part of the intake seems to blend in with the lower fuselage. Looking at photos, there is a definite section of side fuselage under each intake. Moving to the wings, there are separate flaps which are designed to be modeled lowered. There are separate wheel wells and some piping is provided to make those look nicer. Separate speed brakes are also provided. The wheels are a bit shallow in terms of detail and will benefit from replacement. They are properly spoked and the nose wheel is not the later 'finned' version. I think it should have round lightening holes. 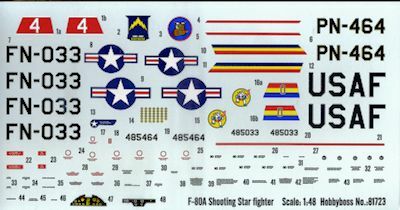 The instructions would have you open holes in the wings for wing racks, but to my knowledge, the F-80A did not have those. The B model had a strengthened wing that was able to handle bombs or additional fuel tanks. Both are included in the kit should you decide you want to use them. 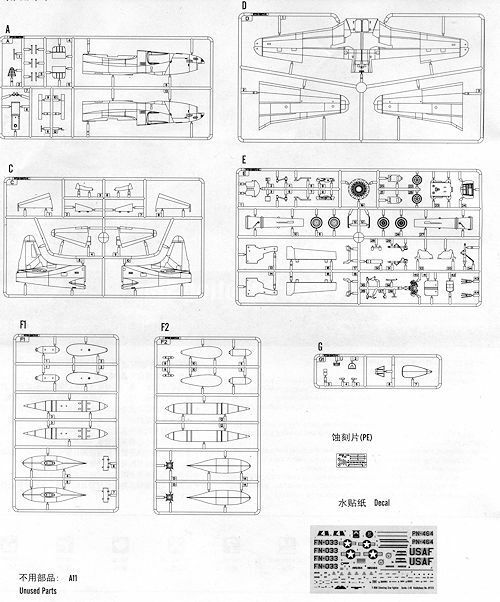 Also not appropriate for the A model are the large Misawa tip tanks that are supplied. Use the smaller tanks. Instructions are well drawn and provide Gunze color information. They would have you paint the bang seat aircraft grey. No cockpit color information is provided. Wheel wells are chromate green with unpainted metal inner gear doors. You get two sets of markings, both from 1948. One os the box art plane that will require some careful masking to duplicate. This is from the 61 FS/56 FQ (I think that is supposed to be FG). and has the later FN buzz number. The other appears to be the plane of the group commander judging from the multi-color bands. This one still has the older PN buzz number. It has yellow wing tips and yellow arrows on the tip tanks. These yellow bits will also need to be painted, as will the black anti-glare nose markings and black wing walk areas. I am sure there will be aftermarket done for this one. The sheet is a goodly size and is well printed. I have had little in the way of difficulties with Hobby Boss decals in the past, finding them to fit rather well. After waiting so long for a new tool F-80, this one is a bit of a mixture. While it has plenty of detail for most, the intake situation sort of takes something away from it. It also continues Hobby Boss' tendency to not get something quite correct. It is puzzling as well for there are a ton of T-33s around and the intake is the same on those as the F-80. This glitch should not have happened. The other things like the tanks, racks, wheels and seat are not a deal breaker with aftermarket sure to provide whatever upgrade bits we might need to take care of that. Despite these issues, I fully plan on building this one. Review kit courtesy of Squadron Products. Get yours at your local retailer.